Add a unique look to your Chevrolet Sonic! This great-looking body side graphics kit is designed to fit perfectly on your Sonic's lower door panel areas as shown. Starting solid at the front, the easy-to-apply graphics gradually fade to the rear as shown. Kit available with "Sport", "Turbo" as well as no badging on the rear door area as shown in image. Kit will fit both Hatchback and Sedan models. 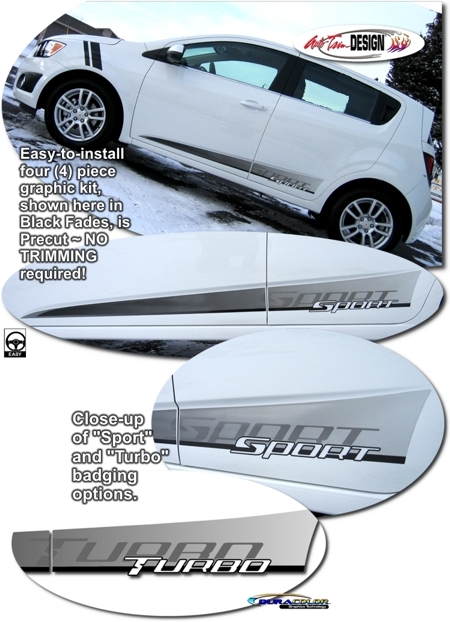 These graphic kits are vehicle specific and will fit any '12-Current Chevrolet Sonic. They will not fit any other vehicle.